It was 2:49 PM during the annual Boston Marathon which took place on April 15, 2013, two bombs went off near the finish line, which was located near Copley Square. The bombs were homemade pressure cookers, and within moments three people were dead, and 264 were injured. Sixteen people lost their limbs as a result. 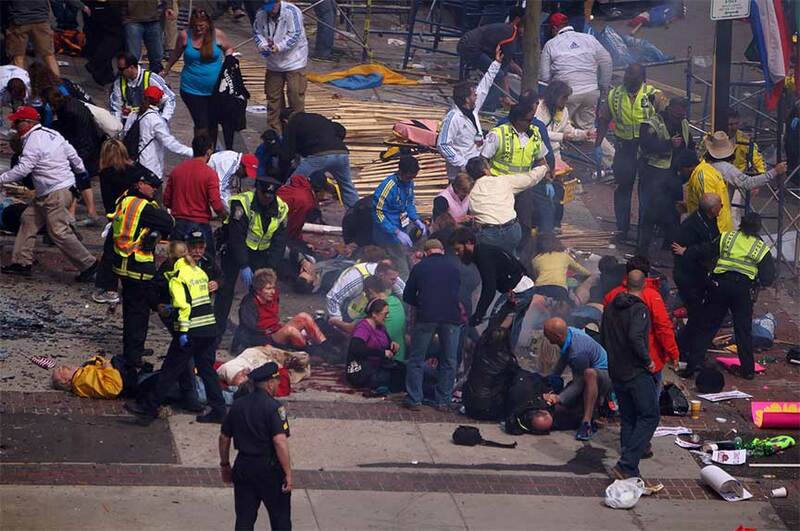 The injured were treated at 27 hospitals and those arriving near the finish line were diverted away from the bomb scene. The FBI took the lead in trying to find the perpetrators of the bombing. They immediately identified two suspect Zhokahr Tsarnaev and Tamerlan Tsarnaev two brothers born in Krygystan. The FBI released photos of the brothers. Soon after the photos were released the brothers killed a police officer in Massachusetts Institute of Technology police department in a failed attempt to get his gun. They then took Dun Mung hostage after carjacking a car. After forcing him to withdraw money from an ATM Meng escaped and called the police. They immediately focused their attention on Watertown were the brothers were last to see. At 12:10 AM on April 19th a police officer identified the brothers in their car. Police officers arrived on the scene. A firefight ensued. Tamerlan ran out of ammunition and was tackled by a police officer. His brother then took their car and accidentally ran him over. The brother died subsequently at the hospital. One police officer was killed in the exchange, and 16 were wounded. The next night Dzhokhar was found in a boat in the backyard. He was captured. After his capture, Dzhokhar who had immigrated to the US in 2002 seeking political asylum stated that he carried out the attacks in retaliation for American actions in Iraq and Afghanistan. No tie could be found to an external group. On May 15th Dzhokhar he was tried in Federal Court was sentenced to death for his acts.